Leading off today: If he'd been sitting at a blackjack table instead of standing on a football sideline Friday, Ossining coach Dan Ricci would have been the guy hitting on 19. And the dealer would have peeled a deuce off the top of the deck for him. Ricci gambled huge down the stretch against Roy C. Ketcham and the Pride came away with a 21-20 win after overcoming a two-touchdown deficit on its home field. Jahseem Gray threw a touchdown to Z'air Field with 11.5 seconds to go to bring Ossining with a point, and Isaiah Beltran hit Josh Manning on the ensuing 2-point conversion for the win. But it was Ricci's gamble that set things in motion. With Ketcham up 14-13 and holding the ball at midfield with 2:30 to go, the Ossining coach told his defense to surrender a touchdown, and Jy'aire Stevens galloped in from 50 yards out. A missed extra point kept the Ketcham lead at 20-13. Ossining then drove to the victory. Wild score of the night: Junior running back Caron Robinson ran for 269 yards on 11 carries and scored three TDs as Aquinas outlasted St. Joseph's 65-56 at New Era Field in Orchard Park. The Little Irish led 65-32 after Trey Brown's fumble recovery and return for a TD and then Roninson's 52-yard rush for a score. CHSFL showdown: Mike Nicosia passed for four touchdowns, the last after briefly exiting with a shoulder injury, as No. 14 Archbishop Stepinac defeated 19th-ranked Class AA rival St. Anthony's 38-19. "There's not too many guys tougher than Michael," Stepinac coach Mike O'Donnell told News 12 Varsity. "He played with an injured shoulder last year and tonight he played through some pain. He has character." Trill Williams followed up his interception on defense by running for a score out of the Wildcat offense while Nicosia was being checked over on the sideline after being injured on the previous series. Clyde-Savannah still rolling: Clyde-Savannah spoiled the first night game ever at Red Jacket beating its Finger Lakes West rival 33-14. Derrick Chance ran for three TDs and made two interceptions, including a 68-yard return for a score. Clyde-Savannah is ranked fourth and Red Jacket 16th this week in Class D.
One of Chance's scores came on a 96-yard carry. Class D clash in Western NY: Quarterback Brock Blecha rushed for three touchdowns as 14th-ranked Franklinville/Ellicottville earned a 26-6 victory at No. 2 Maple Grove. The Titans finished with a 324-84 advantage in total yardage. Blecha finished 16-for-22 for 180 yards through the air, completing 15 consecutive throws at one point in the contest. More surprises: Junior running back Jake Demko rushed for a career-high 197 yards on 29 carries and scored a pair of second-half TDs as Carthage earned a 27-20 win over Whitesboro, ranked fifth in Class A by the New York State Sportswriters Association. QB Jarod Jackson rushed for two scores in the first half as the Comets ended the Warriors' 21-game winning streak against Section 3 competition. • In Class B, Newfane downed No. 9 Medina/Lyndonville 34-6. Prayer answered: Simon Hagen came down with a tipped ball as time expired to score on a 57-yard TD pass and give Hamburg a 19-14 win over Lake Shore. Kyle Shuttleworth (107 yards rushing, 104 passing) threw the Hail Mary pass. More big finishes: Williamsville East drove 95 yards and scored a TD with :25 left to edged Williamsville South 27-24. Colson Skorka threw to Joe Shifflet, who picked up a block from Clayton Osborne and rolled 60 yards to the end zone. • Backup QB Cole Biggins hit Reece Tresco with a 14-yard TD pass with :10 remaining to give LeRoy a 19-18 win over Caledonia-Mumford/ Byron-Bergen. The Oat- kan Knights, ranked 12th in Class C, drove 79 yards in 23 plays to peel 9:53 off the clock en route to the winning score. • Quarterback Ryan Johanson scored on a 1-yard plunge with :54 to play as Minisink Valley pulled out an 8-0 victory vs. Kingston. Working overtime: Pine Plains went ahead on a TD by Matt Beam (three scores, 65 yards) and held on in OT by stopping a 2-point conversion to down Millbrook 27-26. 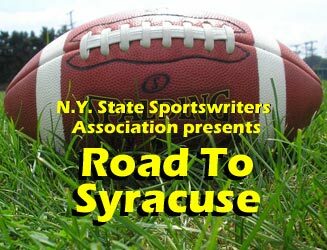 • Running back Michael Anderson (eight catches, 106 yards) scored on a 20-yard throw from Adam Honis in the extra session as Jamesville-DeWitt edged East Syracuse Minoa 26-20. • Riley McNitt's 10-yard scoring run was the difference as Westhill prevailed over Syracuse Institute of Technology 20-14. McNitt finished with 79 yards on 14 carries. Also noteworthy: In Class AA, No. 2 Lancaster blocked two first-half field goals and Max Giordano returned a punt for a touchdown in a 43-20 triumph vs. Orchard Park. Giordano's return came with 2:03 to play in the first half. ... In Class C, top-ranked Newark Valley ran down No. 10 Lansing 43-8. Tyler Beebe carried 16 times for 173 yards and three other Cardinals backs rushed for more than 50 yards apiece. Jake Edinger rushed for 229 yards on 16 carries and scored six TDs as Southern Hills beat Port Byron/Union Springs 49-32. He also chipped in on defense wit 11 tackles and a fumble recovery. ... Michael Parrish recorded four sacks, recovered two fumbles (one for a touchdown) and made three tackles for losses to lead Eastport-South Manor past Comsewogue 30-0. T.J. Gayle gained 150 yards and scored four times on just three carries as Cornwall blanked Wallkill 63-0. ... Devon Hogan scored four of his five rushing TDs in the second quarter of Union-Endicott's 47-6 win over Ithaca. He carried eight times for 120 yards. ... Brett Makar had 16 carries for 215 yards and two TDs, intercepted a pass, recovered a fumble and registered a sack as Yorktown beat Hendrick Hudson 28-14. Stats of the day: New Rochelle now leads its all-time series vs. White Plains for the first time since 1902 thanks to a 48-0 win. The Huguenots are 56-55-5 vs. White Plains. • Queensbury's defense allows just eight yards of offense en route to beating Amsterdam 34-0. • Schuylerville was winning by five touchdowns but didn't register a first down until 9:50 remained in the third quarter of its 42-0 win over Hudson Falls. Scoreboard: Here are the results thus far from Week 3.